The Minnesota Twins opened their season this year on March 31 with a game on the road against the Chicago White Sox. Opening Day is a much-awaited holiday in my house and we all looked forward to watching the game that afternoon. That morning I posted a picture on Facebook that garnered 88 ‘likes.’ In the grand scheme of things it’s not a huge number. But very few of my posts get that sort of attention: my husband finishing his first half-marathon did, as did my proclamation that “I’m leaving for sabbatical” and my subsequent announcement that I’d arrived safely in Germany. This was a picture of a pancake. 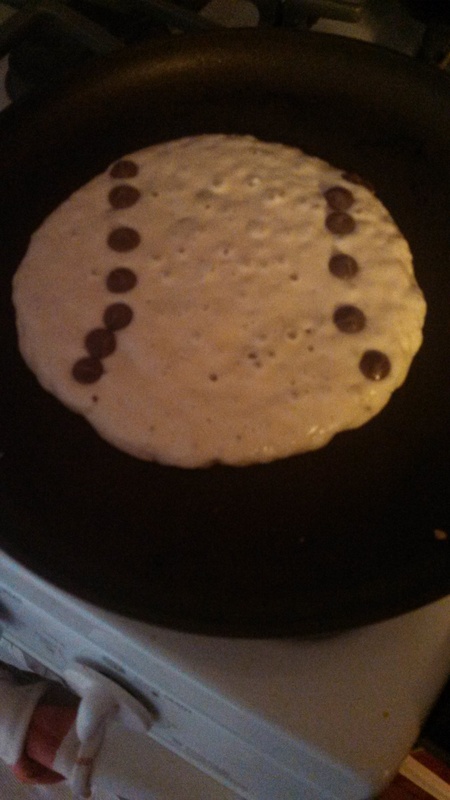 I don’t know if people ‘liked’ the photo because of the pancake I made to look like a baseball with chocolate chips, or because of my admission that “I’m that mom.” Food posts often get great response, but it strikes me that it was something more than that. I’ve read recently about scaling back on minor holiday celebrations, refraining from the attempt to make childhood magical for our kids, and what feels like a general backlash to the Pinterest-ing of our lives. Do we have to have the right color shirt for our kids to wear to school on a certain day? Since when did Dr. Seuss’ birthday become a week-long celebration? And I’m totally good with the sentiment that not everything has to be a celebration, not everything has to be perfect. I especially recoil at much of the secular hype surrounding Christmas and Easter. I like simplicity. I often forget to take pictures of pretty key moments in my family’s life. Except, sometimes? I am that mom. Sometimes, we’re all “that mom” – or that dad. And I’ve realized that I post those days when I win (because clearly it’s a game) at being a parent because all too often, I just really don’t win at all. Too many days contain painful times when I yell at my child for not getting his shoes on fast enough or dawdling over dinner or not doing what I ask the first time. I get frustrated at his frustration with himself when his homework is hard. I get irrationally upset with the mud stains on his pants. Why does he have to slide every day at recess, I think, before responding to myself: Because he’s a baseball-loving almost-9 year old boy. But given that I am sometimes that mom who makes baseball pancakes or manages to get tickets to something I know he’ll love, I’ve found myself reflecting on the balance between making things special and not bowing to a perceived societal pressure. I don’t think anyone needs to go all out for every seemingly minor day, but if it’s something that you and your kids enjoy? Why not? When The Kidlet started school, he came home with the idea of setting a trap for the leprechauns on the night before St. Patrick’s Day. And every year since, he has – completely on his own. We do something small for Valentine’s Day, probably because my own mom did something small for me. Last year he wrote Valentine’s for both of us, too. He said he loved me and my potatoe (sic) soup. It doesn’t get much better than that. I have no illusions that he (always? ever?) thinks I’m the best mom. After all, when the Twins-White Sox game was over, I’m pretty sure he read his book outside on the swings just to get away from me, even after I made him those glorious pancakes. I do these things – the pancakes, the pajama-adventures when he was smaller, the surprise trips, the letters from the leprechauns who somehow manage to evade the traps – because I enjoy them, not because I feel like I have to, or because I’m feeling some sort of Pinterest-pressure to be a perfect, showcase mom. I hope that he remembers, when he’s older, that I made him breakfast, and that we took time to pray as a family before a meal. I hope he can feel the delight I have in seeing his reaction to a surprise. I hope he knows that even when I get angry about the grass stains on (every. single. pair.) of his jeans that my frustration comes from a place of deep care and love. I do these things because I see a glimmer of God’s love in the joy and delight these moments provide our family. — Jenn Moland-Kovash is an ELCA pastor in the northwest suburbs of Chicago. She and her husband both grew up in Minnesota and cheer loudly for the Twins; they have taught their son to do the same. Baseballs are about the only shaped pancakes she can intentionally make. She’s written for The Christian Century, Englewood Review of Books, and Fidelia’s Sisters. Too many times I debate how the picture looks or if the video is social media worthy enough but there is a lot that I do because I want my kids to find love from me in the little things! its being a mom…we just wanted the best for our kids and there is just no perfect formula for it…you might wanted to see this A Piece Of Heaven On Earth…And i think your a sweet mom..I enjoyed reading your post..